Just regular folks. : Bad things. Well, these things always happened. Put protection gears on is a must. After accidents, one has to be watched closely for a long while to make sure that nothing is wrong, especially for the kids and seniors. The roads around your house is not a good place to ride bike. It is just to steep at some places and close to the car traffic. Good to know Vince is OK. Take care. You and Donald had similar accident when both you were on bicycle. So glad Vince is OK. 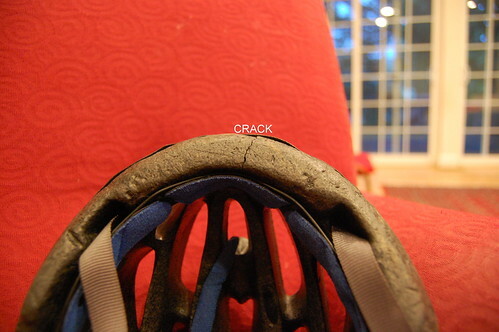 I have to admit, I'm one of those parents -"I never wore a helmet so why do my kids need to" - that picture of the crack in Vince's helmet is going to cause me to put helmets on my kids - Thanks!!! I'm glad he's okay! Especially those teeth. I had a wreck with no helmet and was on a flat road going so slow but hit my head just right and to this day cannot remember anything about the accident after it happened. One minute I was riding and then suddenly hooked onto an elderly man's side view mirror. The next thing, I'm in an ambulance with people staring down at me and wondering where are my pants. I couldn't tell them my name my birthdate, soc. sec#. Now I always wear a helmet. Joshua's helmet saved his cabesa as well. Although he did break his arm. His dad had a wreck and the helmet a very good one, did not cover enough of his head and he required stitches where the chain gear thingy cut just behind and below his ear. They both wear BMX helmets now which provide more coverage. Bridget - I'm happy that you are going to helmet your kids! Sheila - I'm glad you can remember your name now ;P. I think maybe we'll get the BMX helmet next, it is a cooler look.